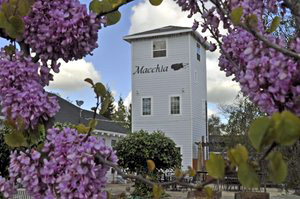 WineWalkabout: Tasting Macchia, Lodi Ca. While in the Lodi area for business Koala was arm wrestled by his friend / business associate into going wine tasting. You must realize what force must have been used to make this happen. Yeah yeah he mentioned it in passing so off we went! The winery selected by Koala’s friend was Macchia. They are a family owned Winery located at 7099 E. Peltier Road Acampo, Ca 95220 in a neat older feeling building surrounded by trees and gardens. As we entered we were very warmly greeted by Tonya. As it turns out she knew Koala’s friend quite well and was not specifically addressing all of the warmth at Koala with this welcome (misinterpreted flattery, put ego away). Tonya was friendly and knowledgeable (family member) about all of the wines, the work behind them all and some insights that come from someone on the inside. Unlike a lot of the area wineries Macchia makes Sangiovese, Barbera, and Nebbiolo as well as the more normal varieties for this area. Taking nothing away from their Zinfandels Koala’s take home for the day was a very nice Barbera. It was very difficult to stay with the one bottle rule. Macchia has a very nice lineup of wines for your drinking pleasure. This is not just Koala’s opinion either as they have received quite a few awards for their wines. Koala suggests that you stop on by and check out what they have to offer, you won’t be disappointed. The tasting room is open Thursday - Monday, from 11:00am to 5:00pm. Tell em Kiwi and Koala sent you! Salinas Valley Food and Wine Pert Deux.